Can you run a farming operation while the kids are in school? This farmer and mother of two, does just that! Between raising heritage breed pigs, to growing and harvesting an orchard, to grapevine physiology consulting, Hilary Graves, defines a new breed of farmer who takes on farming the same way she takes on life, full speed ahead! Find out how she went from viticulture librarian to multi-tasking central coast farmer! Hilary: Most days I check vineyards and meet with clients after I drop my daughters off at school. 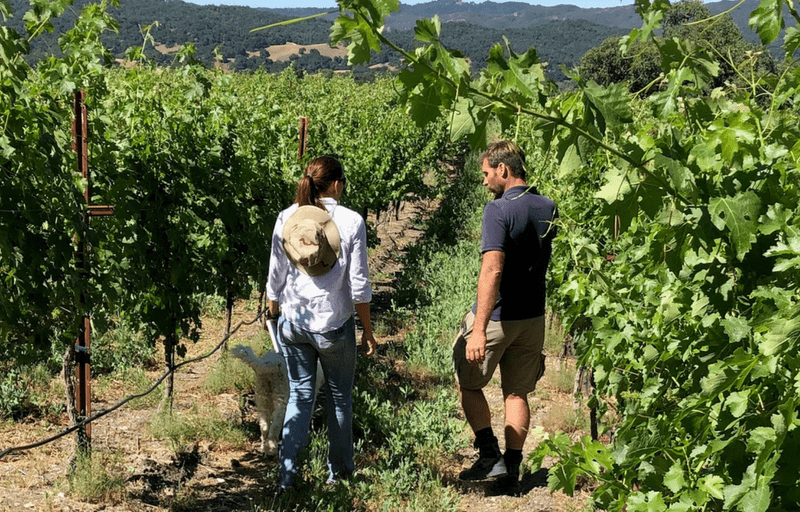 Sometimes I meet with clients to taste wines from their vineyards so that we can strategize on ways to increase wine quality through our farming practices. I tend to do my “outside work” during school hours, and then end up doing emails and notes at night (a bad habit, don’t ever start it). Hilary: There are so many things that I love about farming. Having a new litter of baby pigs is very high on the list. But also, and very important to me, I enjoy learning something new every day. I really like that no two days are the same. The variability keeps me interested and challenged. I appreciate having a job where I can experiment with new ways to achieve a goal. And most of all I love my colleagues! Hilary: Currently I serve as the treasurer of San Luis Obispo County Farm Bureau and Vice President of the Estrella El Pomar Creston Water District. I am also on the board at my daughters’ school. Hilary: I got into farming in a very round-about way. Although my grandfather was a farmer, I did not expect to go into farming myself. I was a librarian at the Viticulture and Enology Research Center at Fresno State and I started taking classes in viticulture so that I could eventually get a second master’s degree which was required for me to get tenure. I finished up at Cal Poly after moving to the Central Coast for my husband’s job, and started building a consulting business when my daughters were born. I made wine for 12 years (2002-2014) from grapes that I grew at our own vineyard. I’ve since stopped making wine and ripped out my vineyard to plant an orchard. But my consulting work in grapevine physiology is still going strong. Hilary: I am totally addicted to CrossFit, and I go crazy if I don’t hit the gym at least 5 days a week. Hilary: Oh boy. Be patient and tenacious. Find a mentor and learn as much as you can from that person. Prepare yourself to advocate for agriculture often. Hilary: I like to encourage a wide variety of flora and fauna to take up residence, so we leave a few small brush piles around for quail to live in and we have owl boxes (with owls!). My new orchard was established with weed matting, omitting the need to spray herbicides. I’m also learning more about biodynamics to see if that is something that I can incorporate into my orchard.